I happen to be very proud of the website you see before you and there are a couple of reasons for this. The first is I would like to think I’ve done everyone a service by helping you understand that memory foam mattresses can be affordable without compromising on quality. The second is the fact that I’ve done my best to keep budget in mind. That is to say I’m not all about attempting to get you to purchase a product when you might not need to. So, for this section I’m going to review (what I think) is one of the best mattress toppers out there. The model I’m going tell you about is the 3 inch, 4lb density Visco memory foam mattress bed topper. As you read through the review I have done my best to make sure I point out the pluses as well as the negatives because this one won’t suit everyone. I know how awful it can be when you dread going to bed at night. That old spring mattress (or any other type of that matter) stares up at you and you feel like you’re about to, yet again, attempt to sleep on something that feels like a bed of nails when you wake up the next morning. This mattress topper will change all that, as it is been specifically designed with old mattresses in mind. What I mean is if your current mattress has indentations or sagging areas that you dread lying on, this model will help. The manufacturer has used three inches of four pound density memory foam so even if you have sagging areas on your bed, it will make them disappear just like magic. Unlike a lot of memory foam technology which rely on heat in order to contour to your body, this one doesn’t need that. No matter how cool or warm your body is, the minute you lie down it will begin to cradle you, and at the same time support various pressure points which can be the cause of those morning aches and pains. What I will say is because this mattress topper is 4 pound density and 3 inches in depth, it will have a fairly soft feel especially if you’re muscular or weigh more than average. It’s also better for those of you who like to sleep on your backs. That said if you are around the 160lb mark in weight this topper is great for both back and side sleepers. I decided to add a section in my review about this because you may find the standard instructions might not work for you. This is due to temperature. It is delivered vacuum packed and compressed so no matter what, you will have to unpack and wait for it to expand. However, although the manufacturer recommends you wait for at least 96 hours this is based on the ambient temperature being around 72 degrees Fahrenheit. Any more than this and it may take longer to expand. If it’s cooler than this, you might be able to use it sooner. I’ve also come across a lot of comments about the odor this mattress topper gives off when it’s first unpacked, and whilst this is completely harmless (more on that shortly), it may be an annoyance to you. The best way round this problem is to make sure the room you’re using is well aired for a couple of days before use. Again, depending on what time of year it is, it will depend on how long it takes for the smell to fade. Now I come back to the fact that if you do get that “new” smell from this mattress topper there is no need to worry about harmful gasses. This is because it has been manufactured above and beyond the regulations set out by PURGreen. What this essentially means is you’re guaranteed a product that has been manufactured and packaged in the US. Plus, this mattress pad meets all EPA and CSPC standards ensuring it’s free from harmful chemicals. 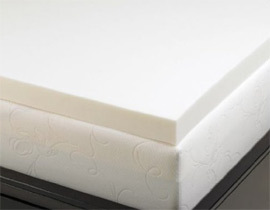 No ozone depleting substances like Chlorofluorocarbons, harmful metals, Polybrominated Biphenyl Ether substances, Prohibited Phthalates and Formaldehyde are used in the manufacturing process which makes this one of the “greenest” and safest mattress toppers on the market. If you can’t afford to get rid of that old mattress but can’t put up with how uncomfortable it is, I think this mattress topper is the perfect answer. Price is important and I think you’ll find some of the best bargains going on Amazon so if you’re interested why not take a look? Oh, and they have these available in the following sizes: Twin, Full, Queen, King, California King and Twin XL.